Nicola Kelly (BBC News, 2016) reports that honey is perceived to have healing properties in African countries. Such suggestions may result in companies such as Mavis Venderby adopting strategies to expand overseas. Consider the various options of overseas expansion and the financial returns from such sales (including transactions in a foreign currency). At an upmarket cafe in Nairobi, trendy millennials swipe through their smart phones while sipping glasses of “dawa”, a hot drink made from locally sourced honey, ginger and lemon. 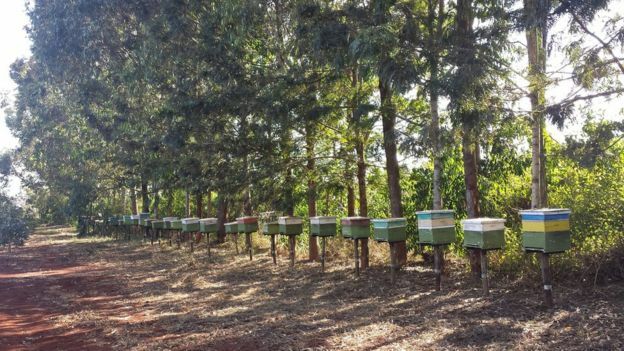 Here in the heart of Kenya’s “Silicon Savannah”, tech-savvy entrepreneurs are beginning to tap into a market that, until recently, was the preserve of smallholder farmers known locally as honey hunters. For them, the introduction of new hives and modern harvesting methods mark an unwelcome shift away from the traditions passed down through the generations. 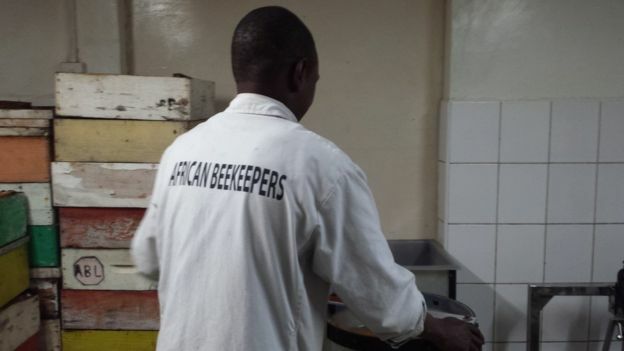 But entrepreneur Ernest Simeoni says the honey hunters will need to adapt their practices if they are to make the most of the honey industry, now worth more than $12bn (£10bn) globally. 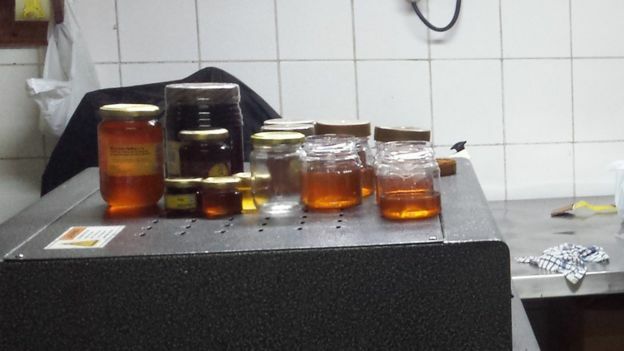 Mr Simeoni believes the rise of the middle class in Kenya, coupled with advances in digital technology, have made honey production accessible to a wider pool of people. “Farming with apps – this is the future,” he says, pointing to more than 20 icons on his phone. One of the most popular is the “Swarm Database”, an app that provides real-time information and alerts farmers when their honey is ready to harvest. WhatsApp groups are also helping young Kenyan farmers to share ideas and experiment with new methods of honey production. But, Mr Simeoni explains, there are still a number of obstacles to overcome. He says that methods of honey production in Kenya need to be modernised. Grace Asiko from the National Beekeeping Institute, an affiliate of the Ministry of Livestock and Agriculture, agrees that more can be done to tap the honey market. Diversifying the ways in which the honey can be used is also an area of potential growth, she says. High up in the Taita Hills of south-east Kenya, nestled among macadamia and pineapple plantations, the picture is very different for Hagai Mwaisaka, a traditional honey hunter. 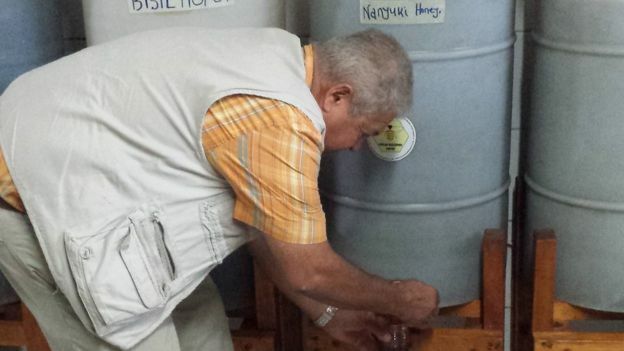 Hagai is one of nearly two million honey producers in this part of the country. He points proudly at the log hive – a debarked, hollow tree stump – swaying gently in the breeze in the acacia tree outside his hut. Honey hunting is the traditional method of climbing trees, tipping the log hive at an angle and allowing the honey to drip through the combs. It is typically done at night without clothes to ensure that bees do not stick to the fabric and sting the skin beneath. “At night, the bees are cool. They are not so active, so I can harvest the honey without disrupting them,” Mr Mwaisaka explains. From this one log hive, 40,000 busy bees will produce 60kg of honey each year. 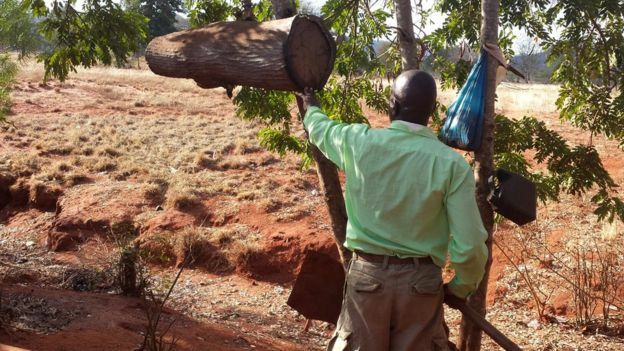 Mr Mwaisaka will be able to sell this honey for $10/kg – enough to sustain his family. But this may all be about to change. The new hives being introduced by businessmen in Nairobi mean that honey hunters will soon be required to change their methods, “smoking out” the bees rather than extracting and combing the honey by hand. For traditional honey hunters like Mr Mwaisaka, the new methods will have a detrimental effect on the quality of the honey. Unfortunately for Mr Mwaisaka and other farmers in this part of Kenya, there is little that can dampen the spirits of traders and innovators in Nairobi. Businessman Ernest Simeoni believes the honey industry is the next big money-making venture. Click here to access the original article. Some interesting background information on the nature of bee farming in the UK that may give rise to a rise in demand for bee hives. Thank you to the Telegraph for their article on the beekeeping industry. ‘All the honey is gathered in about 10 weeks a year, when fine weather coincides with abundant flowers. For the remaining 40 weeks or so, the bees eat the honey themselves – roughly 265lb per hive a year. On a good day a hive of bees make 20lb or more of honey – so if you get 60lb a year from just one hive, all that could have been made in three days. You need a week of good weather in July – that’s when you get good honey.’ – suggest the ever increasing focus on being able to produce hives ready for the March – July sales window and consider the impact of inventory building on working capital or the sales mix between slatted or box hives. ‘Beekeeping has been neglected by successive governments over the last 20 to 30 years. There’s a lot of advice out there for farmers and a lot of that advice could be applied to bees. There are 350 members of the Bee Farmers’ Association, but only 150 earn a proper living from bees. It’s 10 times as big in France.’ – suggests that there could well be rapid expansion following changes in government policy towards beekeeping. This is particularly true at present, when bees are under threat from a variety of sources, from the varroa mite to pesticides, incursions into the green belt and the industrialisation of the rural landscape. Bees, as we all know, are vital to agriculture, and thus to the population as a whole, so it is fascinating to travel with Wainwright up on to Salisbury Plain to enter their world. – consider exploring the application of Porter’s Diamond to consider overseas expansion for basic or advanced factors to stimulate growth for Mavis Venderby. In much the same way that Sizewell beach in Suffolk owes its rich diversity of maritime plants and seabirds in part to restricted access around the nearby nuclear power station, Salisbury Plain is home to almost 100 species of rare plants and insects by virtue of a large part being owned by the Ministry of Defence and therefore out of bounds to the public. This incongruous pairing of purpose and place is part of what makes Salisbury Plain such an extraordinary landscape – it is the largest area of chalk grassland in north-west Europe, 300 square miles of undulating green folds that have barely changed since the Romans tramped across them on their way to Old Sarum. Today, if you venture upwards on to the bits of the plain that are still accessible, you will find yourself – almost uniquely in this country – enveloped in a vast silence broken only by birdsong and the hum of a thousand bees. In so far as it is possible to tell a bee where to go, many of them are here because of David Wainwright. Wainwright is the chairman of the UK’s Bee Farmers’ Association and keeps bees all over the country, including in 10 lots of hives on Salisbury Plain, from which he supplies wild-flower honey to Marks & Spencer. He grew up in Tring, a suburban boy fascinated by wildlife – ‘Insects and things that lived in ponds,’ he says. He studied biology at the University of Sussex, where he kept bees at his digs, along with a wasps’ nest that he had captured by anaesthetising the inhabitants. He stored the wasps in his bedroom, feeding them raw meat, and must have been enormously popular with his fellow lodgers. Wainwright created that market, selling the honey in Germany. In 1990, when his by now two children reached school age, he came back to Britain to set up Tropical Forest Products. The company imports African honey, including products of Ethiopia and Cameroon, which arrive in vast drums and are packaged in Wales. This is still one of his main activities, carried out in tandem with travelling around the country checking on his bees. ‘The population of bees is down to human husbandry,’ he says. ‘We need amateur beekeepers – and there are more of them now – but we also need more bee farmers. This is particularly true at present, when bees are under threat from a variety of sources, from the varroa mite to pesticides, incursions into the green belt and the industrialisation of the rural landscape. Bees, as we all know, are vital to agriculture, and thus to the population as a whole, so it is fascinating to travel with Wainwright up on to Salisbury Plain to enter their world. Life slows down as we drive through a Ravilious landscape, bumping along between banks of cow parsley and buttercups, poppies, elderflower and wild rose in an elderly car whose pockets rustle with dead bees, to visit one of Wainwright’s bee colonies. Eventually we reach a cluster of 24 hives set among stretches of field beans overlooking steep valleys of chalk full of wildflowers. On windy days the bees go down into the valleys to gather pollen, but today we can hear faint humming among the beans, which increases in strength as we approach the hives. ‘Some bees are more irritable than others,’ Wainwright says. ‘You can sometimes get one very irritable bee, but you can calm them with smoke.’ Bangs on the hives and jolts upset them. Wainwright makes his own beehives – all in different colours so that the queen can find her way back to the right hive. Amid the constant, and now much louder, hum of bees, he opens up one hive, brushes off the dead drones (the allotted lifespan of a drone is two to three months) and reveals sheets of beeswax in wooden frames. Bees navigate using magnetic fields and search for pollen within a four-mile radius; most pollen is gathered one mile from the hive. The nearer the crop they are the better. ‘We try to put the bees next to the crop so that they don’t waste time and energy flying,’ Wainwright says. ‘Honey is their fuel – they use honey to fly to and from the hive.’ They are very susceptible to the weather. ‘They like sun, not much wind and a reasonable moisture level – if it’s too wet or windy, they can’t do anything. Wainwright’s hives are arranged like stacks of boxes, each containing 10 combs. The queen and the developing bees stay in the bottom box and the honey is in the top boxes. At the end of summer, Wainwright removes some top boxes, leaving enough for the bees to live on for the rest of winter and into spring. On average he can gather 100lb of honey per hive, but the national average is lower. Salisbury Plain is particularly good for bees because of the diversity of the plants – many types of clover, cow parsley, daisies, vetch, orchids, sainfoin. Wildflower meadows produce a lot of honey with a faint cinnamon flavour from the sweet clover. Natural landscapes such as this are vital for the bees, but farmers could help too, Wainwright says, ‘by planting margins with nectar-yielding plants. But there needs to be a plan to help redevelop the bee industry. Conducting a tasting of all his honeys is revelatory – each has a distinct flavour. The Salisbury Plain version is suffused with the scent of wildflowers and grasses, with a faint cinnamon edge. It is delicious, a world away from the strong African and manuka honeys that have grown so popular – the nostalgic taste of an English summer. Click here for a copy of the original article. BBC News reported a Royal Beekeeper pleaded guilty to administering a banned drug to honey bees. A first in the UK. Consider the implications of materials used in the manufacturing process that may have positive or negative impacts on bees, the importance of complying with regulatory requirements and the financial/strategic implications of non-compliance. 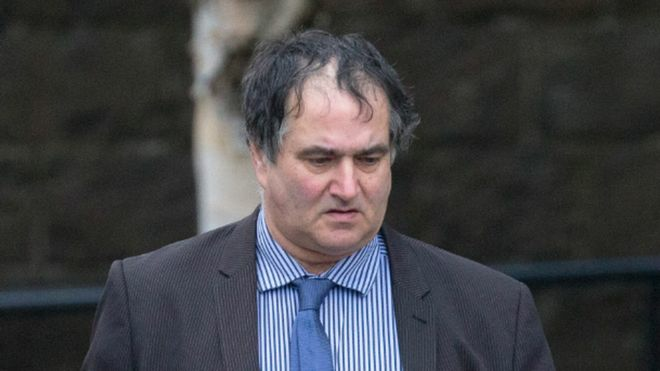 A Royal beekeeper has admitted giving a banned drug to his honey bees in what is believed to be the first case of its kind in the UK. 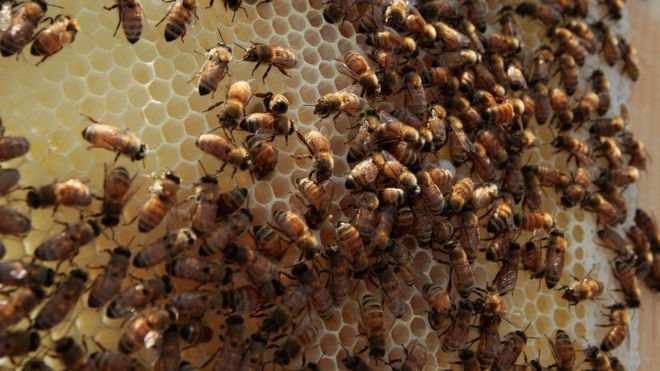 Apiarist Murray McGregor, the owner of Denrosa Apiaries in Blairgowrie, pled guilty to administering “unauthorised veterinary medicinal products”. The 61-year-old has produced honey for both the Balmoral Estate and Prince Charles’ Duchy Estate. He admitted committing the breach between July 2009 and October 2010. During the period, McGregor admitted importing the unauthorised medicinal product, Terramycin 100MR. He also admitted giving Terramycin 100MR to an animal, namely the honey bee, in contravention of the relevant regulations. He admitted a third charge of possessing the substance without authorisation. Perth Sheriff Court was told that a further expert report on the case was being prepared. In 2009, a bee farm the Lothians owned by McGregor was targeted by thieves and 11 hives containing up to 500,000 bees were stolen. The bees, which were being farmed under the Denrosa banner, were due to be transferred to the Balmoral Estate. Click here to access the original story. Thanks to the Honey Association for their Honey Trivia (click here for the original article). Honey bees must gather nectar from two million flowers to make one pound of honey. One bee would therefore have to fly around 90,000 miles – three times around the globe – to make one pound of honey. The average honey bee will actually make only one twelfth of a teaspoon of honey in its lifetime. A honey bee can fly as fast as 15 miles per hour. It takes one ounce of honey to fuel a bee’s flight around the world. Worker bees are all female. Flowers have bright markings and strong smells to attract bees and other insects so that they will pollinate flowers. Some also have dark lines called ‘honey guides’ which scientists believe help insects find their way into the flowers. A colony of bees consists of tens of thousands of worker bees, one queen and sometimes drones (male bees). The honey bee is the only insect that produces food eaten by man. Honey has always been highly regarded as a medicine. It is thought to help everything from sore throats and digestive disorders to skin problems and hay fever. Honey has antiseptic properties and historically was often used as a dressing for wounds and a first aid treatment for burns and cuts. Honey lasts for ever – or nearly. An explorer who found a 2000 year old jar of honey in an Egyptian tomb said it tasted delicious! The natural fruit sugars in honey – fructose and glucose – are very quickly digested by the body. This is why sportsmen and athletes use honey to give them a natural energy boost. The Romans used honey instead of gold to pay their taxes. Honey bees have been producing honey in the same way for 150 million years. The bees’ buzz is the sound made by their wings which beat 11,400 times per minute. Bees feed their larvae on pollen or ‘cakes’ made from pollen and saliva, using honey as a source of food during winter months. As they make more than they need, we humans can share the fruit of their labours. The term ‘beeline’ comes from the ‘bee line’ these clever insects make to the flower of their choice, using the shortest route possible. In Ancient Egypt honey had a role in births, deaths and marriages; it provided the energy and inspiration to create a child, was used to make special honey cakes as an offering to placate the gods and was an ingredient in embalming fluids. Nearly one million tonnes of honey is produced worldwide every year. Honey’s ability to attract and retain moisture means that it has long been used as a beauty treatment. It was part of Cleopatra’s daily beauty ritual. In India , Krishna, as an avatar of Vishnu, has a blue bee in the middle of his forehead. Soma, the moon, is called a bee. The Greek Great Mother was known as the Queen Bee, and her priestesses were called Mellisae, the Bees. In Celtic myths, bees possess a secret wisdom garnered from the other world. In Australia and Africa bees are found as tribal totems. I did promise that I would share my thoughts with you on what may appear across the five variants of the February 2017 CIMA Operational Case Study exams. Having spent some time scouring the internet and will start to share my resources with you. The Flow Hive “It’s the beekeepers dream, turn a tap right on your beehive and watch pure fresh honey flow right out of your Flow™ hive and into your Jar! No mess no fuss and the bees are hardly disturbed.” A short video, that highlights the innovative nature of the Flow Hive that may help boost revenues at Mavis Venderby, especially to large scale bee keepers. Consider the E1 strategic benefits of such a product and product lifecycle issues, F1 and sources of finance required and P1 costing systems to manufacture/set selling prices. For all of those sitting the February 2017 Operational Case Study Exam, here’s a link to the pre-seen information that all five variants of the exam are based upon. You will need to become familiar with Mavis Venderby, for the purpose of the exam, you will bee (puntastic!) a Finance Officer within Mavis Venderby and be expected to understand and apply your knowledge from across the operational level syllabus to the specific issues that arise for the manufacturers of beehives. I’ll bee-ver away over the next few days to provide some background information on the industry etc..
CIMA have shared the 2016 pass rates for OT exams and the November Case Study exams, a rather impressive set of results highlighting how prepared students are for their exams. Well done to students for their hard work and dedication to a challenging professional qualification and bravo to faculty members alike for supporting students towards success! Check out our great pass rates! Pass rates for both the Objective Tests and Case Study exams continue to rise. For the November case study, pass rates were: Operational 67%; Management 71% and Strategic 65% . We have seen positive pass rates in the OTs across the majority of subjects. The even better news is that pass rates are continuing to rise, particularly across the Management and Strategic level subjects. Strong pass rates and the flexibility of the our syllabus and assessments mean students are able to progress much more quickly and achieve the career success they deserve. The subject the highest first time pass rate is E2 at 86% followed by F1 with 77%. Success in Operational Case Study Exams – Hints and Tips to Succeed! CIMA have published a recording of their student webinar held on 18 Jan to highlight the approaches students should adopt to succeed in their Operational Case Study exam.